Pensacola, Florida - A 29-year-old motorcyclist from Pensacola was killed Tuesday morning while attempting to exit I-110 at Davis Highway. According to the Florida Highway Patrol (FHP), the man took the exit, veered onto the shoulder, the motorcycle overturned, and the man was thrown into the guardrail beams. The FHP reports that the motorcyclist died from injuries sustained in the crash. If you or someone close to you has been injured in a motorcycle accident as a result of the intentional or negligent action of another driver, your immediate concern should be receiving any necessary medical treatment. In the days and weeks that follow an accident, however, the mounting cost of medical bills can add insult to injury. Watch this short video to learn more about who can be held finanically responsible for injuries sustained in a motorcycle accident. If you've been injured in a motorcycle accident, you have the right to bring a claim against any party responsible for causing the accident. If your claim cannot be settled out of court, you may have the right to bring a lawsuit to recover for any damage you suffered. Should you speak to the at-fault driver's insurance company? When and how can you gather evidence supporting your claim? Do you even need an attorney? 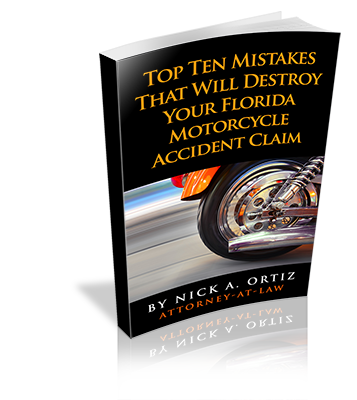 To learn more about how to preserve your claim, recieve a FREE download of Top 10 Mistakes That Will Destroy Your Florida Motorcycle Accident Claim. In the side bar on your left, you'll find valuable resources we've created to keep you informed and empowered to protect your rights. If you or someone you love has been injured in a motorcycle accident, you'll find the answers to many of your questions in our FAQ pages. Or, if you're just interested in learning more about the subject of personal injury, our Library and Blog is filled with in-depth articles, covering many aspects of tort law. Find answers to actual client questions, provided by a knowledgeable Pensacola personal injury lawyers. Beyond physical injury and property damage, we understand that a motorcycle accident can seem to turn your entire life upside down. You'll have a lot of questions, but it can be difficult to know where to turn. Ortiz Law Firm is here to help by offering free consultations to accident victims. If you have any questions about your accident claim, or if you're in need of a FREE case evaluation because you've been injured in an accident, please call us at 850-308-7833, or fill out the contact form below.